This post represents another installment in the series detailing the second of our three cross country National Parks camping trips with kids and travel trailer in tow. Prior to our first National Parks trip with the kids back in 2007, we hadn’t yet experienced the delight of camping directly in State or National Park campgrounds. We had only had our first travel trailer for a year, and most of our early camping trips involved private RV parks with activities for children. It was during that 2007 journey that we ventured into the Madison Campground in Yellowstone National Park. That two night stay would forever change our camping lives and I devoted a blog post to that event some time ago (A Camping Epiphany - link HERE). So, when planning the second of our National Parks trips in 2010, I was focusing on state and federally operated campgrounds in the locations we would be visiting. The first night of the trip, we stayed in the RV section of one of the travel plazas on the Ohio Turnpike. The second night would bring us to our first actual campground, and a love affair was born that very night. “Is the Nation’s number one federal provider of outdoor recreation. What does all this have to do with camping, you ask? Well, the COE is responsible for more than 400 lake and river projects in 43 of our 50 states and, as a result, is actually one of the country’s leading federal providers of outdoor and water-based recreation. 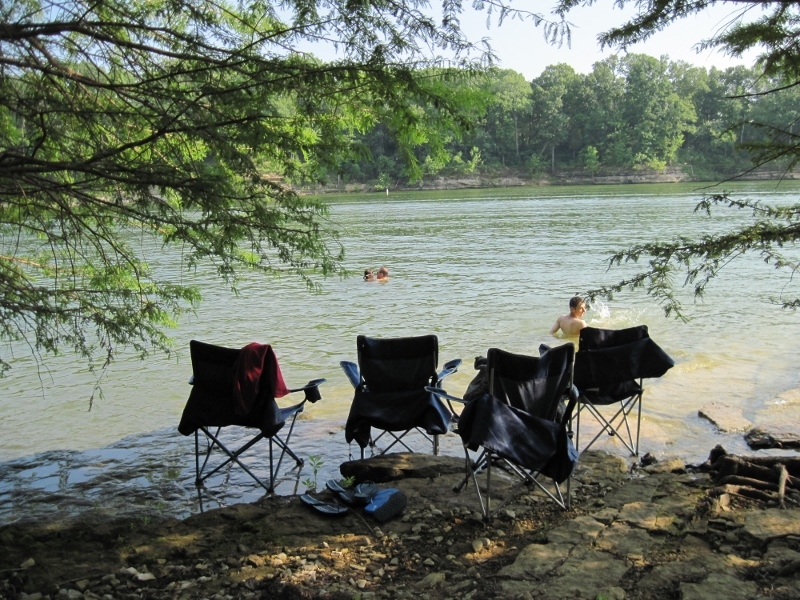 Translated to camping language, that means that you can find many absolutely magnificent campgrounds on rivers, lakes and reservoirs throughout our country that are operated by the COE and open to the general public. When we left our home in the northeast for this epic journey to the National Parks of the southwest, we could have headed due west after that first night in Ohio. Instead we chose to drop south first to experience Mammoth Cave National Park, and then head west from there, allowing us to catch Gateway Arch National Park in St. Louis along the way. 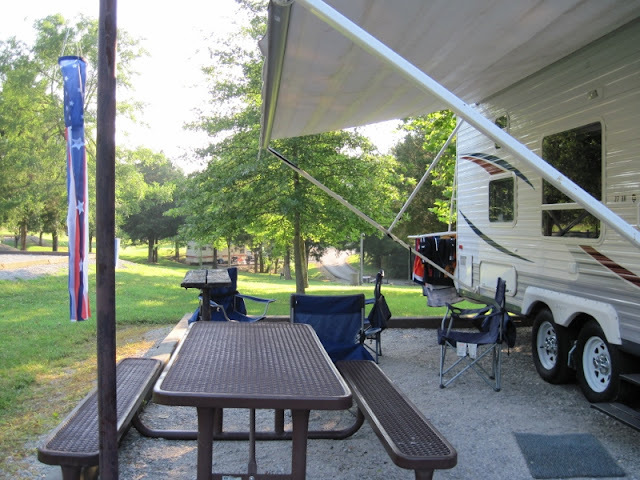 When scouting for a campground in or near Mammoth Cave NP, I came upon the Wax Campground, a COE facility in Clarkson, Kentucky, less than 20 miles from the Park. If you’re a regular reader, you’ll know that we are a boating family. Alan and I bought our first boat back in 1986, long before the kiddos came along. 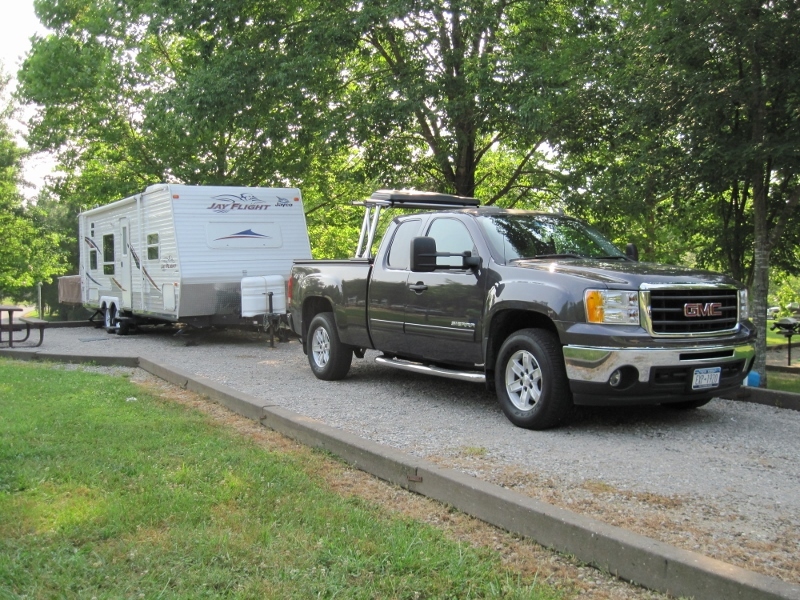 Although there are campgrounds in Mammoth Cave NP itself, finding a campground like Wax with excellent reviews and a location right on the water was huge for us; it would make an excellent home base for us while we explored Mammoth Cave. And so, we arrived at our first COE campground on a summer night in July 2010. Wax Campground is directly on Nolin River Lake, a 5,795 acre opportunity for adventures on the water. Our adventures were limited to swimming, but we would have enjoyed the opportunity to stay and play longer, and I wouldn’t hesitate to return. The campground host was warm and welcoming, our campsite was lovely, the facilities were clean and well-kept and the easy access to the water was appreciated. Wax has 110 sites that can be reserved; 86 of them have water and electric hookups. The facility offers flush toilets, showers, a dump station, a playground, a boat launch and a public marina. The Wax Campground is enjoying a well-deserved rating of 9 (excellent!) 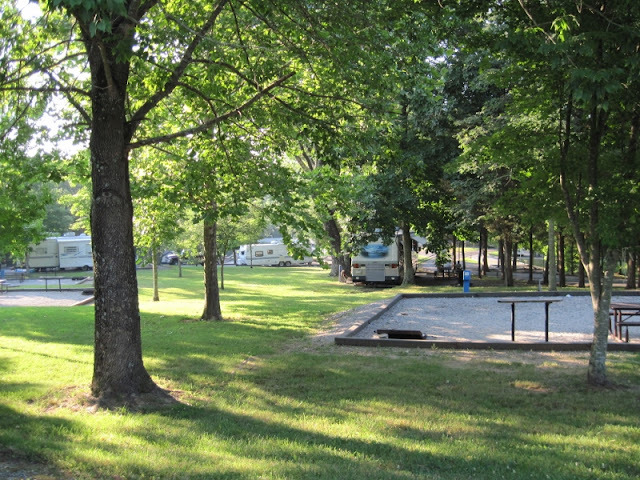 on RV Park Reviews (link HERE) and sites may be reserved through Recreation.gov (link HERE). Site B036 - It had plenty of length . . .
. . . and was well designed, too! 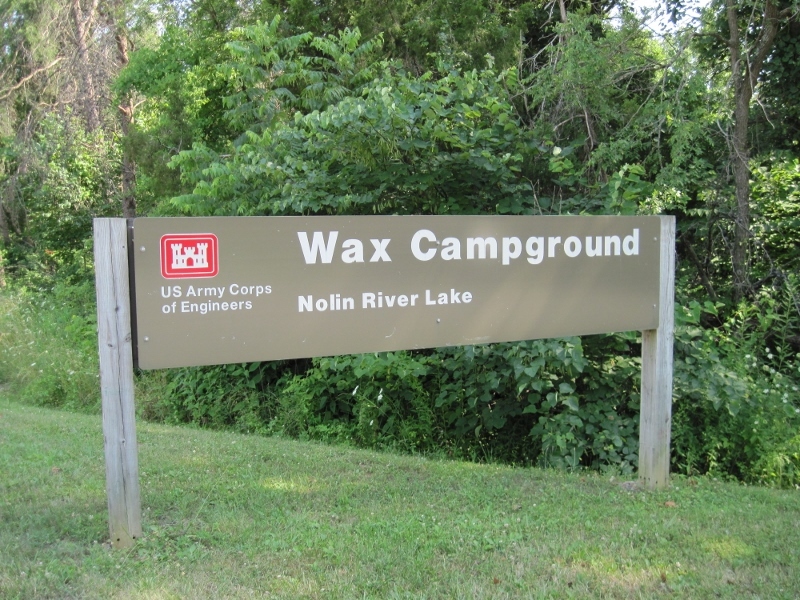 Our stay at Wax was all too brief, but that first experience with a COE campground spawned a love affair with the U.S. Army Corps of Engineers that remains alive and well to this day. For our family, transferring our allegiance from private RV parks to campgrounds within State and National Parks was a perfect fit to the lifestyle we enjoyed as the kids got older. The COE provides excellent facilities in great locations, opportunities to kayak and (power) boat on the water we love and the peace and quiet of nights spent in the great outdoors, far from the hustle and bustle of everyday life. Was it love at first sight? Yes, absolutely! And it was love at first “site,” too! Thank you for stopping by and please do return for future installments of this series. Next time, I’ll share with you my favorite road sign of all time which we encountered on our way to Mammoth Cave. Wait 'til you see what it says!